Oh, right, our role: we are carving out a new, deeper niche for Bike Hugger. Our goal is to serve the under-served audience, one that seeks higher quality information and wants to be free of advertiser and retail bias. We write about what we ride, wear, and like. And we expect you to pay for the service. 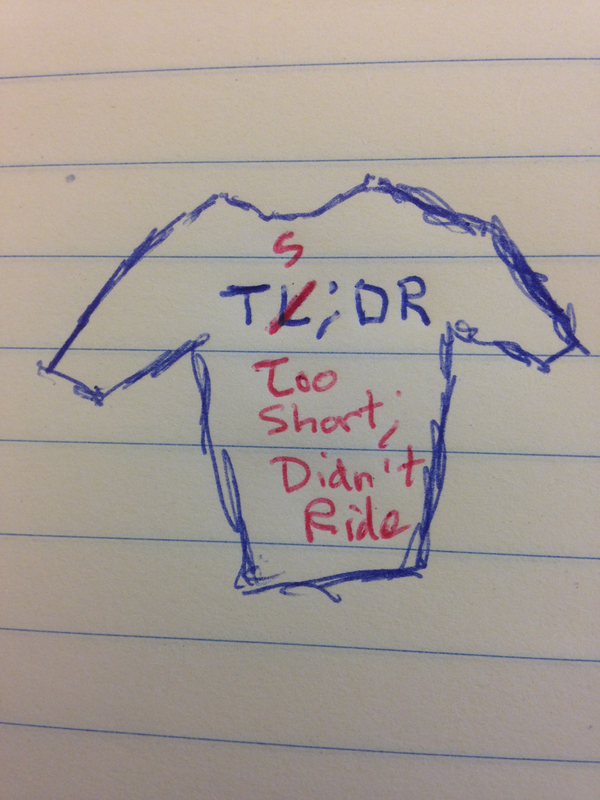 TL;DR made me think of “Too Long; Didn’t Ride™,” which could either be the basis for A) an app featuring short but great crowd-sourced cycling routes for busy people or B) a T-shirt for long-distance cyclists (see attached terrible sketch). That terrible sketch may lead to a new startup!